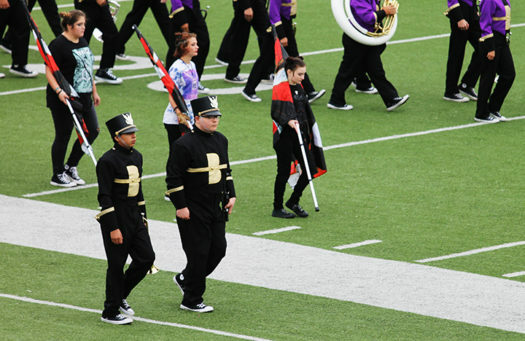 Drum majors Colby Menefee and Omar Almeida lead the band onto the field during contest. This is our house – let’s blow their faces off! Those are the words of band director Jeff Villarreal said just before the Bison Brigade went on to perform on the McAllen field for UIL contest. The band received a score of 2, 2, 3, meaning the band got an overall score of a 2. The contest is rated on 1 being the best and 4 being the worst. The Brigade’s show this year was “Fueled By Ramen.” The show included the songs Some Nights by Fun, Victorious by Panic at the Disco, Irresistible by Fall Out Boys and Ride by Twenty One Pilots. While contest is over, the Brigade will continue to practice and perform.